A complete interior and exterior renovation of a trio of contiguous party wall buildings built in the 1880's. 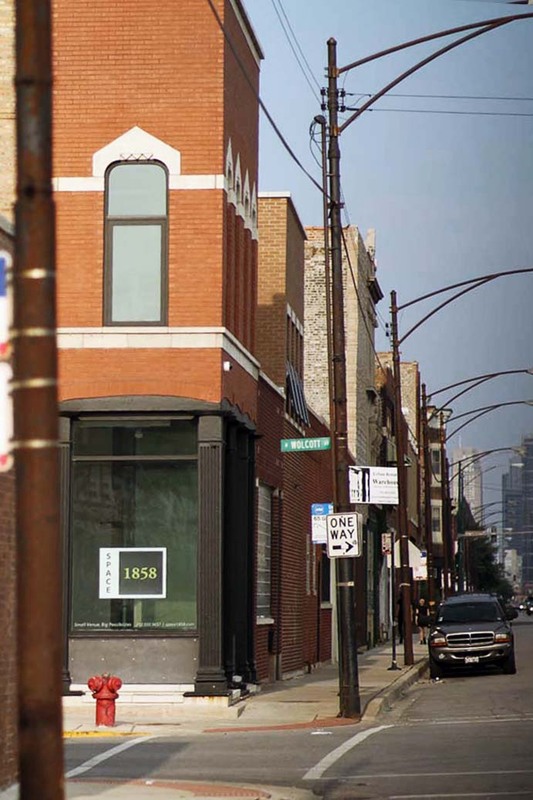 1858 W. Grand/509 N. Wolcott - The corner building, which was originally used as a lampshade factory on the first floor and an apartment on the second floor was re-designed to accommodate the offices of Nicholas Design Collaborative and a first floor commercial space which fronts onto Grand Avenue. The exterior walls, which were covered in plaster, was uncovered to reveal 8' tall windows with arched limestone lintels with carved dentils at the second floor, providing a flood on natural light into those spaces. The brick exterior walls were either entirely rebuilt or tuck pointed. Cast iron storefront columns and beams, buried beneath layers of brick were restored and a new center entry glass storefront was added to create an attractive home for Space 1858, and event space operated by NCA Properties. A new green roof, accessible from the second floor office of NDC was installed for the enjoyment of staff and guests. 1854 - 1856 W. Grand - The exterior brick walls for the home of Phonology recording studios, most of which were failing structurally were rebuilt and redesigned to provide a safe and dry environment for sound studios with future plans to press vinyl records for an expanding industry.